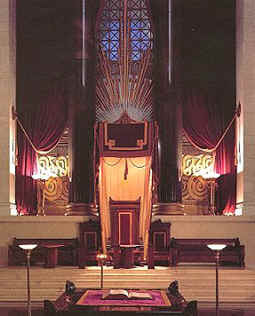 In their temples masons always have the Bible on an honorable place; they address to God in their oaths. On the emblem of the New York lodge you see the Arc of the Covenant, and the inscription below: «Holiness to the Lord! ». Masons are widely engaged in charities, finance construction of hospitals, children's houses and hospitals. Both an ignorant newcomer, and a mason of the initial degrees, usually has no understanding about the true goals of the lodge. Mason websites usually answer equally the question how confidential the Masonry is. ““It really isn't "secretive," - they speak, - although it sometimes has that reputation … A secret organization is one which conceals its membership, has secret meeting places and which the public has little knowledge regarding its organization or its principles. This does not fit the Masonic Fraternity at all… Masons certainly don't make a secret of the fact that they are members of the fraternity. We wear rings, lapel pins and tie tacks with Masonic emblems. Masonic buildings are clearly marked, and are usually listed in the phone book. Only some information concerning the methods of identification of masons (i.e. the passwords), privacy of each member's ballot and some details of degrees are the private information”. Sometimes, they continue to convince, masons speak about the mason secrets, when they are not capable to express those remarkable sincere changes, which occur to them in words, therefore, not having found suitable words, they can simply tell: «it is the mason secret». «Try to tell someone exactly what you feel when you see a beautiful sunset, or when you hear music, like the national anthem, which suddenly stirs old memories, and you'll understand what we mean» *. It is told nice, but it is convincing? Let's see what already known to us Albert Pike says on this account.